This species is close to Protanilla rafflesi, but in profile view, posterodorsal corner of propodeum evenly convex; petiolar node strongly narrowed upward, anterior face nearly straight, dorsal face weakly convex, anterodorsal corner blunt. Holotype(工蚁): TL 2.6, HL 0.53, HW 0.40, CI 76, SL 0.43, SI 106, ML 0.28, PW 0.33, AL 0.75, PNL 0.18, PNH 0.30, PNW 0.23, PPNL 0.20, PPNH 0.30, PPNW 0.23. In full face view, head longer than broad, anterior 1/3 of the head distinctly narrowed forward. Lateral sides weakly convex, anterolateral corners prominent and tooth-like, strongly concave before the teeth. Occipital margin weakly concave. Occipital corners roundly prominent. Mandibles elongate and down-curved apically, laterodorsal surface with a longitudinal groove, basal corners roundly prominent, masticatory margin with about 12 peg-like teeth. Clypeus roughly trapezoidal, anterior margin nearly straight. Antennae 12-segmented, apices of scapes just reached to occipital corners, flagella segments 2-10 about as broad as long. In profile view, pronotum weakly convex. Promesonotal suture complete but not depressed. Dorsum of mesonotum straight and weakly slope down backward. Metanotal groove shallowly depressed. Dorsum of propodeum weakly convex, posterodorsal corner evenly convex; declivity weakly convex, about 1/2 length of the dorsum. Propodeal spiracle circular and small, lower down on the side. Metapleural bulla elongate and roughly elliptical, close to the spiracle. Petiolar node nearly trapezoidal, anterior face nearly straight, about as long as dorsal face, dorsal and posterior faces weakly convex; anterodorsal corner blunt, higher than posterodorsal corner, the latter rounded; ventral face oblique and straight, anteroventral process roughly square, with circular semitransparent fenestra. Postpetiolar node strongly inclined forward, dorsum roundly convex, anterodorsal corner bluntly prominent, anterior face straight; ventral face roundly convex, anteroventral corner roundly protruding. Sting strong and extruding. In dorsal view, petiolar node broader than long, width : length = 1.4:1, slightly widened backward; lateral sides weakly convex, anterior and posterior faces nearly straight. Postpetiolar node about as broad as long, width : length = 1.1:1, weakly widened backward, lateral sides and anterior face roundly convex, posterior face nearly straight. Anterior margin of gaster nearly straight. Mandibles, head, and body smooth and shining. Dorsa of head and body with sparse erect to suberect hairs and dense decumbent pubescence. Scapes and tibiae with abundant subdecumbent short hairs and dense decumbent pubescence. 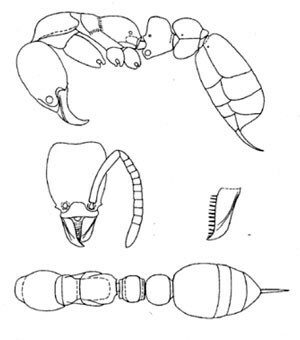 Mouthparts with abundant longer hairs, apex of mandible with a long stout hair on the ventral face. Color reddish brown. Mandibles, antennae, and legs brownish yellow. Paratype worker: TL 2.7, HL 0.51, HW 0.40, CI 78, SL 0.40, SI 100, ML 0.25, PW 0.33, AL 0.83, PNL 0.18, PNH 0.31, PNW 0.23, PPNL 0.20, PPNH 0.30, PPNW 0.23 (1 individual measured.). As holotype. Xu ZH. 2012. Furcotanilla, a new genus of the ant subfamily Leptanillinae from China with descriptions of two new species of Protanilla and P. rafflesi Taylor (Hymenoptera: Formicidae). Sociobiology 59, 477–491.